Thank you to everyone who participated in the 2017 Architectural Scavenger Hunt in celebration of National Preservation Month! We hope that you enjoyed your experience exploring the wonderful City and County of Spokane. Our region enjoys a fascinating history and incredible architecture and, believe us, there’s a lot to look at! We are hard at work tallying the answers and calculating results to find our winners! The results will be coming soon and will be found on the Preservation Month page! Also, be sure to click on the image to see a close up of the original clue! In 1908 Emmett Robinson, manager of the Moler Barber College, had this house built. 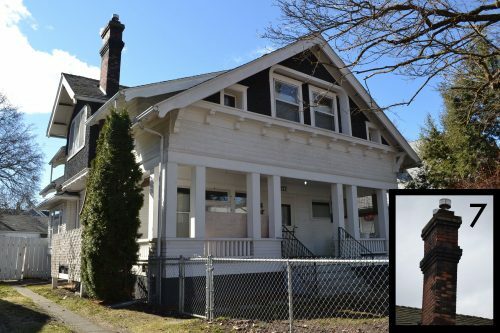 In 1913 Eben Palmer, treasurer for Spokane, Portland & Seattle Railway, bought the house. In 1920 Charles McDonald, an attorney, obtained the property. C.J. Hall purchased the house in 1939, owning it until 1984. A large wrap-around front porch distinguishes this Classical Revival-influenced residence. Elegant columns with Ionic capitals establish the curved lines of the porch, which wraps around a corner window bay. The second floor gable ends have half-timber cladding, and partial cornice returns. 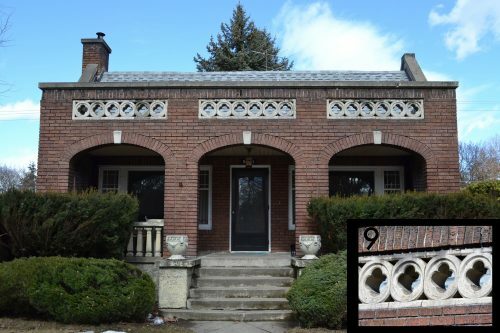 The clue depicts a two-toned brick detail found on the west side of the home. Harry Skinner, builder, contractor and associate of D.C. Corbin, built this house in 1902. This was the first house on Corbin Park and has been used as a bed & breakfast in the past; although it is once again a single family home. Harry Skinner was the father-in-law of architect, W.W. Hyslop. This house demonstrates such classic Queen Anne elements as a hipped roof with gable wings and a large corner turret. The large wrap-around porch is another feature of the style, as is the decorative spindlework visible in the gable peaks. Decorative modillions and a bevelled glass porthole window further embellish the house. This clue highlights the railings on the wraparound porch. Roy Bungay, the original owner of this 1904 residence, served as assistant manager of D.C. Corbin’s Washington State Sugar Company. He later formed Johnson-Bungay Fuel company with John Johnson of 319 Waverly Place. This large American Foursquare style house boasts four prominent roof dormers and Colonial Revival detailing. A second story balcony is supported by four Ionic columns and also serves as a porch cover. The front dormer has a small balcony at the cornice line. The original tripartite window groupings have been retained, as have the multipane windows. The clue can be located in the home’s gable. Architect W.W. Hyslop designed and built this house for himself and his family in 1904. Hyslop’s son, Robert, acquired the house in 1949. 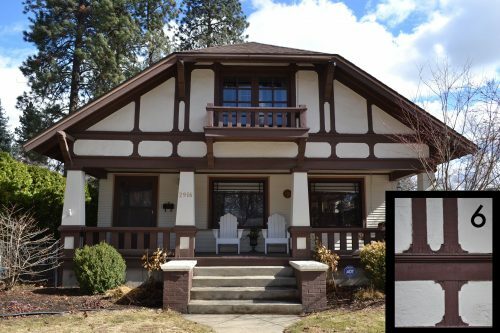 W.W. Hyslop was responsible for many noteworthy houses and buildings around Corbin Park and throughout Spokane. His designs include the Marlboro Apartments, 525 W. Waverly Place, 615 W. Waverly Place, and 2913 N. West Oval. Robert B. Hyslop was a noted Spokane structural engineer, and following his retirement, he authored Spokane’s Building Blocks in 1983. 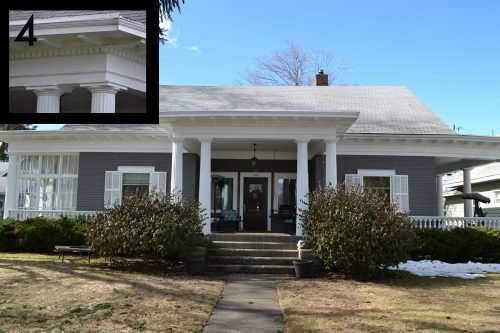 The full-width porch with classical style columns are some of the Neoclassical elements on this house. Decorative modillions and dentils further embellish the façade. Some alterations have been made to the exterior, but the original cladding and windows have been left intact. 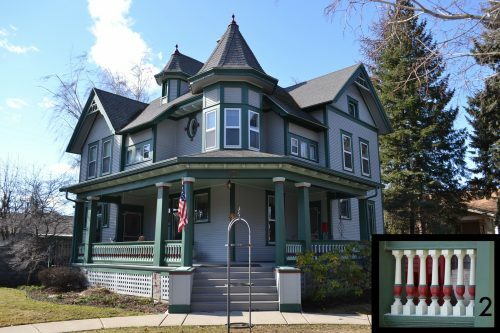 The clue depicts the top of the home’s prominent columns. In 1910 Rev. William Hindley, Pastor of the Pilgrim Congregational Church, resided here. The following year Hindley was elected Mayor of Spokane, serving in that capacity from March, 1911 to November, 1918; he also served as Commissioner of Public Affairs in 1910. Hindley sold the house to Emil Skone in 1922. 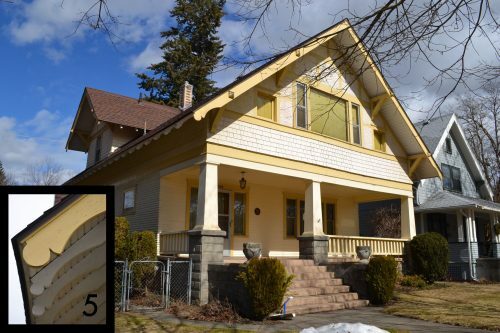 This one-and-a-half story Craftsman retains its original horizontal and wood shingle cladding, as well as the half-timbering in the gable ends. Three large battered posts rest on concrete block bases, and support the porch roof. Decoratively cut rafter ends embellish the eaves. 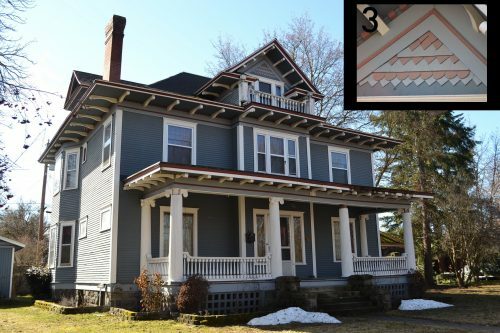 This clue showcases the home’s decoratively cut fascia and exposed rafter tails. R.W. Hackett bought this house in 1916, selling it one year later to Daniel Bagnell, who was employed in the mining profession. A broad, full-width porch graces the front façade of this house. The house has a lovely jerkinhead or clipped gable roof that makes it a unique addition to the neighborhood. Battered posts support the roof overhang that covers the porch. A small balcony is seen in the front clipped gable end, which is clad with half-timbering. Two gabled dormers enhance the north and south roof slopes. The clue is a close up detail of the half-timbering work on the front exterior of the home. 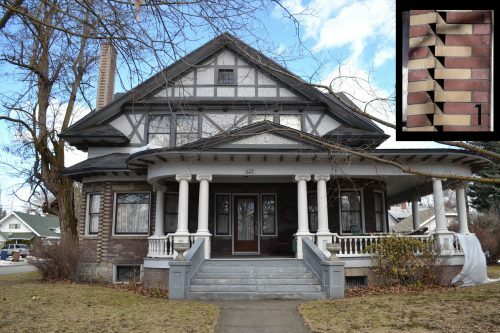 Prominent owners of this 1909 residence include original owner, J.E. Reisinger, Manager of Fidelity Lumber Company; Fordyes C. Farr, who served as manager of the Traction Street Car Company and superintendent of the Spokane Traction Company (1912); and Mr. Richard Hargreaves who purchased the property in 1917. Hargreaves first worked as the principal for the nearby North Central High School, and later became the president of the Eastern Washington College of Education. This school would one day change its name to Eastern Washington University, and the campus today includes a building named after Mr. Hargreaves. This residence with Craftsman details features a covered front porch with ten posts, set in a 3-2-2-3 configuration. A small wooden cornice, just below the upper floor windows, is supported by decorative wooden modillions. The house boasts shedded wall dormers on the east and west facades, as well as decoratively cut-out rafter tails. The clue showcases the home’s interesting chimney. In 1908 T. Harry Lantry, a Northern Pacific R.R. Trainmaster, bought this house from F.A. Foss. The Lantry’s owned the house until 1925. This home was built in 1907 in the Eclectic style. This brick and stucco residence boasts a raised cut stone foundation which reaches the sill line of the first floor. Four round posts help support the front roof overhang, as do two large brick posts at the corners. The front façade is distinguished by a large balcony and two porthole windows in the gable. A window bay projects out from the west façade. The clue depicts one of the second story’s round windows. 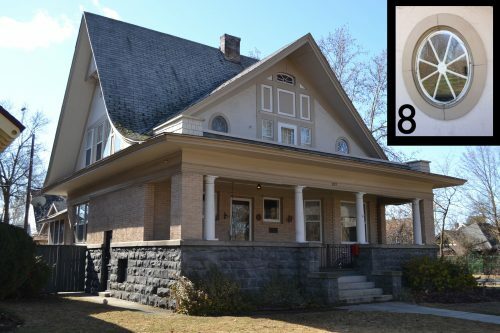 Built in 1922, this unusual home contrasts with many of the American Foursquare and Craftsman homes in the area, thereby giving the Corbin Park Historic District more variety. Although this residence has no single stylistic influence, the large front porch which dominates the building (and a former terracotta colored tile roof) reflects a Mediterranean influence. The eclectic nature of this house is displayed in the gable-end parapets, a Gothic stylistic influence, and the fenestration, which is more of a Craftsman style element. The porch is embellished by cast concrete decoration and keystone accents. The clue highlights the lovely detail work on the front of the home. This bungalow home was constructed in 1923. 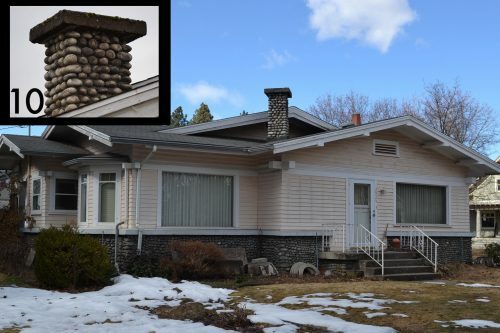 The most interesting stylistic features of the house are its river rock stone chimney and foundation. These smooth cobblestones are relatively uniform in size and have hidden mortar joints. The widely overhanging eaves and low slung roof place this residence firmly in the Craftsman bungalow style, and there may have originally been a large front porch. It has double front gables as well as double side gables. This clue is of the river rock stone chimney. 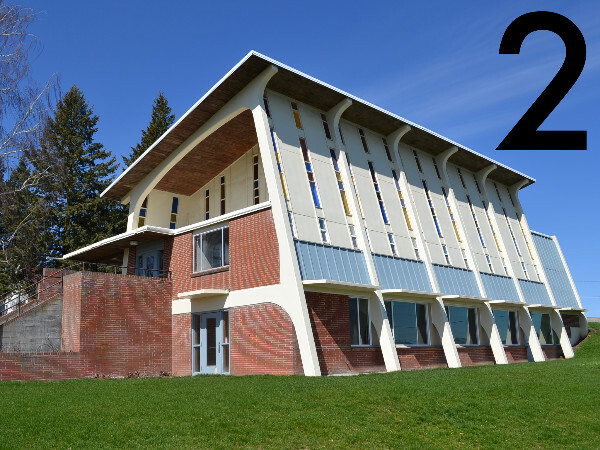 The former Mater Cleri Seminary was built in 1962 by the Spokane Diocese of the Roman Catholic Church in Colbert, WA. The building was designed by Funk, Murray, & Johnson Architects. The first class at Mater Cleri included 50 high school students and 15 college freshman, but by 1974 the diocese closed Mater Cleri due to low attendance. Today the Mater Cleri Seminary building is used as part of Northwest Christian’s high school campus. 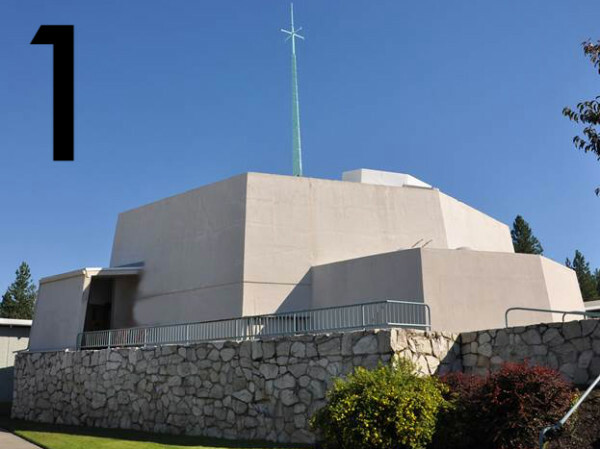 The Fairfield Adventist Church was designed by Douglas Durkoop and built in 1963. It is a gorgeous example of mid-century architecture, and is visible from Highway 27. 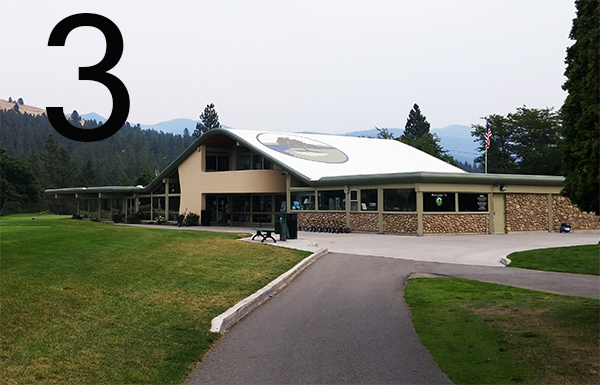 The Liberty Lake Golf Course Club House was designed by architect Warren Heylman. The building was constructed in 1958, and is still enjoyed today by golfers and mid-century architecture lovers alike.